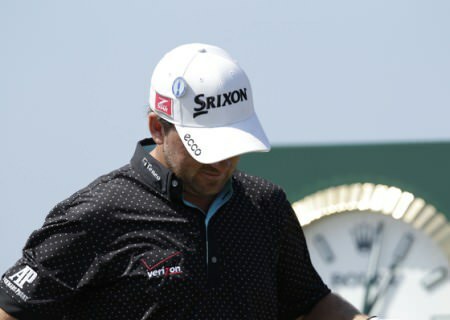 Graeme McDowell was not happy about being put on the clock so early in his third round. Picture Eoin Clarke www.golffile.ieGraeme McDowell was fuming over stopwatch-happy referees after being put on the clock not once but twice en route to a two over 73 in The Open. The Portrush star saw his title hopes suffer a blow when he slipped to joint 25th on six over par heading into the final round. But he was less than pleased with officialdom on a day when Japan’s Hideki Matsuyama became the second player to be handed a stroke penalty in a major this season. Frustrated after a tough day on the course, McDowell said: “We only played four holes and they told us on the fourth tee that we were two and a half minutes behind schedule. All right. Fine, we got off to a slow start. We were cutting it very close. “On the fourth hole, I had a decent shot in there. Gregory Bourdy hit a great shot on the front edge, which came back in the bunker. “We walk onto the fifth tee and they told us we were four and a half minutes out of position, and we’re going to be put on the clock. We’re like, what? Surely we’re allowed to get off to a bad start. McDowell bogeyed the third, birdied the fifth but then bogeyed the sixth, eighth and ninth to turn in 39. He bounced back with birdies at the 12th and 14th before a bunkered tee shot at the last led to another bogey that left him disappointed with his performance. Whatever about the R&A’s slow play policy, McDowell believes that they have been slightly harsh in their set up of the bunkers at Muirfield, which is a view shared by stablemate Shane Lowry. Believing the extra sand in the traps prevents balls from rolling down into flattish lies, he said: “I think if you go out and look at the groove marks in these bunkers, they’ve got that touch of Memorial four or five years ago when Jack decided to go with the wide grooves in the [rakes in the] bunkers. “The sand is very soft and there’s lots of it. They’re a real hazard this week. I think bunkers should be penal at times. “They’re not particularly deep in places, these traps. So they’ve decided to make them hazards in a different way, by making the ball stick against the lips. And it becomes a little bit of a lottery which way your ball goes into it; does it go into it at pace? Does it roll in? Which side of the lip does it get in? Like I say, for such a fair golf course like this one, it brings an element of chance into it, which I don’t love. “Like I say, so many contrived, manufactured stances when you hit in the trap, you’re honestly kind of walking up there just hoping to have something, you know. And they’re penal enough. They don’t have to be that way. 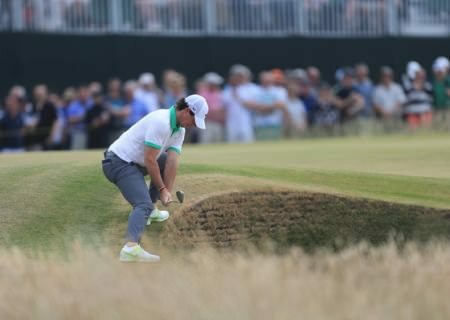 Rory McIlroy struggled to get a stance for a bunker shot earlier this week. 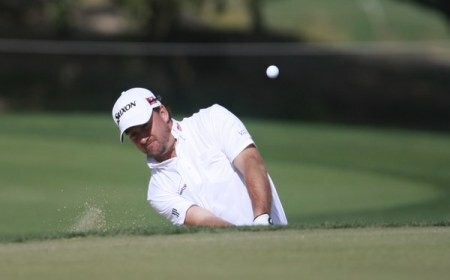 Picture Eoin Clarke www.golffile.ie“I like traps that roll into the bottom. When you’ve got a steep lip in front of you, chip it out, you know. But these are kind of sticking in the sides and kind of all weird and wonderful things. So it doesn’t really fit to me with the fairness of this place. “Like I say, I’m not playing well, so if I start criticising it, it’s sour grapes. It’s really just an observation. I’ve probably had about ten trap shots in three rounds, and I’d say two of them have been normal. Two of them have been flat lies. The other ones have been up against lips, coming out sides, no stance, one foot in, one foot out. That kind of stuff. “There’s no doubt there’s an argument for how much of hazard should a bunker be. There’s a definite argument there. Should they be pristine, beautiful lies where the top players in the world can pinch them off the top? It’s better than rough. It’s better than fairway. It shouldn’t be that way for sure. Lowry shot a 75 that left him tied for 63rd on 10 over and also expressed his dislike for the traps after watching playing partner Ollie Fisher make an eight on the 18th after twice failing to get out of traps. “I think the bunkers are set up poorly to be honest,” Lowry said. “I think there is too much sand in them. The ball goes up against the face. Like Ollie on 18, he just pulls his tee shot a bit and he has no second shot. Graeme McDowell was disappointed but he refused to blame anyone but himself after his 75. 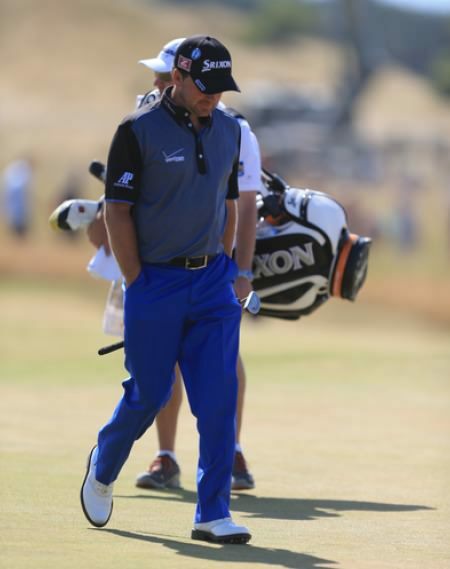 Picture Eoin Clarke www.golffile.ieGraeme McDowell refused to blame the tough pins or slick greens as he slid to a three over 75 at slippery Muirfield. Clarke backs R&A: "You can fine people all you want but shots are the only thing that are going to make any difference"